"Have you ever opened a book, read the first chapter and found your eyes so full of tears that you had to blink them back to continue reading? Well, get set because you’ll find yourself immersed in the Leilani Farm Sanctuary surrounds described so vividly that you can visualize the creatures inhabiting eight acres of this wonderful garden of delights — writing so realistic that you almost feel as if you’re really there. You can “see” the sights, “hear” the sounds, and “smell” the fragrant tropical flowers. You’ll also be captivated by the author’s courage in disclosing some of the traumatic events of her life that led her to a hard-driving corporate career and then to giving it all up to being the very model of champion of all animals, large and small, those valued as “pets” as well as those viewed as “production units” destined for slaughter for humans to eat. You’ll be introduced to a large variety of lovable creatures from pigs, sheep, donkeys, deer, chickens, rabbits, cats, turkeys, ducks, geese, guinea pigs, tortoises, and even wild boars. From the first chapter to the last, you’ll be captivated by this amazing chronicle of an incredible life’s adventure. 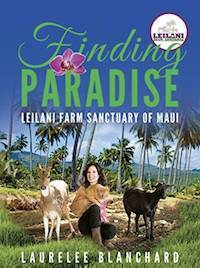 I’d expected that this beautiful book would be an amazing story, as well, about the history of Leilani Farm Sanctuary and about some of the individual rescued animals there. It did not disappoint. However, the first part, about founder Laurelee Blanchard’s childhood and younger adult years, was unexpected. Her childhood experiences made me ache for the helpless child that she had been, and for the even more helpless animals that she had loved, as they all suffered from cruelty that they should never have experienced. But it was, at the same time, for Laurelee, a beginning towards becoming the caring, capable and generous human being that I’ve been privileged to get to know through our mutual work with the Vegetarian Society of Hawaii, someone who used everything that she’d experienced in a positive way to inform and shape her future actions and goals, and eventually to create Leilani Farm Sanctuary, where animals who otherwise would have suffered shortened, unhappy lives as commodities, could enjoy a very different kind of life, cherished and freely spending their days interacting with other animals and humans according to their own personalities. In their turn, at Leilani, these animals constantly surprise and teach the humans who meet them some beautiful lessons about their fellow creatures on this planet of ours. Thank you, Laurelee, for this wonderful gift, both to animals and to the rest of us!